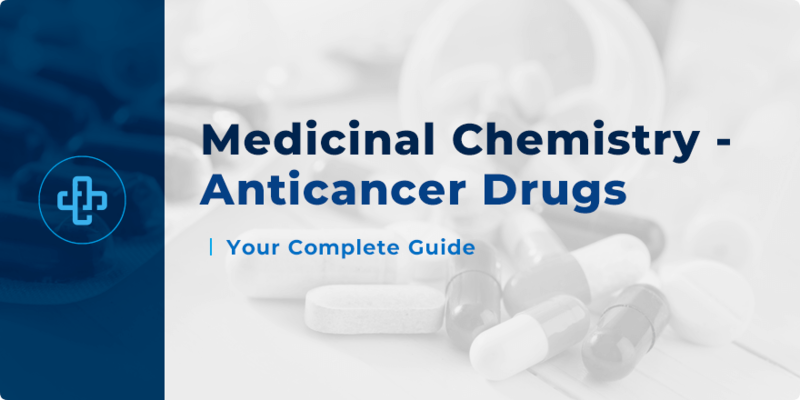 This section will describe the medicinal chemistry of anticancer drugs. Sometimes called antineoplastic agents, these drugs are of immense importance to society. This section will focus on, specifically, DNA-interactive drugs. Contrary to popular belief, cancer is not a single disease. Cancer is the generic term used to describe a large group of diseases characterised by uncontrolled growth of cells in the body which can potentially spread to other sites in the body. According to the World Health Organisation (WHO), more than one hundred types of cancer are known, each requiring unique treatment and diagnosis. It is estimated that approximately 8.2 million people die each year of cancer. Cancer has been known since antiquity, with the earliest records dating back to the ancient Egyptians. Modern approaches in treating cancer include radiotherapy, surgery, chemotherapy and often combinations of the aforementioned approaches. Radiotherapy, surgery and the genetic basis of cancer will not be discussed here. Although a bit old, both ‘The Genetic Basis of Human Cancer’ by B. Volgstein and K. W. Kinzler and ‘Oncogene-Directed Therapies’ edited by J. Rak provide a good overview of cancer genetics for the interested reader. Chemotherapy involves the use of one or more anticancer drugs as part of a standardised chemotherapy regimen to treat cancer. Due to the fact that cancer cells are derived from normal cells, the quest to find drug targets unique to cancer cell remains a gargantuan challenge for researchers. Drugs used in chemotherapy often affect drug targets that are present both in normal and cancer cells. In general, cancer cells tend to grow more rapidly and take in substances such as drugs quicker. The majority of antineoplastic agents rely on this feature of rapid growth. Unfortunately, some cancer cells do not grow rapidly. Moreover, normal cells that grow rapidly such as bone marrow cells also take in drugs quicker and these drugs also affect normal cells. Drugs for the treatment of cancer include ones that can act on structural proteins, enzymes and nucleic acids. Antibody-based therapy and hormone-based treatments also exist. The medicinal chemistry of anticancer drugs is broad topic. This section will mainly focus on DNA-interactive agents. A previous article briefly describes drugs that target nucleic acids. Groove binders, intercalators, alkylating agents, chain terminators, and chain cutters were briefly described. This article will focus on alkylating agents, metallating agents, topoisomerase inhibitors and intercalators. It is highly recommended that the reader reads the previously published article before proceeding. Nucleic acids such as DNA are biopolymers made up of nucleotides. In essence, DNA carries the genetic information of a cell. Interfering with DNA can lead to cell death. As mentioned in a previously published article, the nucleobases have nucleophilic groups. Alkylating agents are electrophilic compounds that can react with DNA. This is one of the cases where drugs form covalent bonds with their target. Selectivity is an issue with alkylating agents. Since proteins also contain nucleophilic groups, it is also possible to alkylate proteins. Drugs that bear two alkylating moieties can lead to intrastrand or interstrand crosslinking. Dacarbazine is a methylating agent used to treat various cancers such as Hodgkin lymphoma. One of the generated species during the metabolism of dacarbazine in the body is the reactive methyldiazonium ion. Radiolabelling studies indicate that methylation of DNA occurs in the minor groove at N7 guanine. Reactions also occur at O6 guanine, O4 and O2 thymine and N3 adenine. Chlormethine is an alkylating agent first introduced during the 1940s. This drug is capable of crosslinking guanine groups. Chlormethine belongs to a class of drugs called nitrogen mustards, which are capable of DNA crosslinking. The mechanism of action of chlormethine is shown below. Can you draw the next steps of the mechanism? Due to chlormethine’s highly reactive nature, less reactive derivatives have been developed. An example of such a derivative is melphalan. By incorporating an aromatic ring, nitrogen’s lone pair interacts with the π system of the ring thus slowing the formation of the aziridinium. One other advantage of melphalan over chlormethine is the incorporation of the amino acid, L-Phenylalanine. Due to this moiety, melphalan is more likely recognised by various proteins as an amino acid and is thus more likely to be carried into the cell. Cyclophosphamide is an organophosphorus nitrogen mustard alkylating agent that requires activation by metabolic and nonmetabolic processes in vivo. So by definition, cyclophosphamide is a prodrug. The ring undergoes hydroxylation C4 in a regioselective fashion. This C4 hydroxy derivative is in equilibrium with ring-opened aldophosphamide. The ring-opened species decomposes to give the phosphoramide mustard and acrolein via spontaneous β-elimination. The nucleophicity of the nitrogen in the generated phosphoramide mustard is affected by the phosphoramide group. As a result, there is increased selectivity for stronger nucleophiles like guanine. One advantage of cylophosphamide is decreased GI toxicity since metabolic activation in the liver is required. However, the generate acrolein is urotoxic and nephrotoxic. Acrolein is thought to alkylate cysteine residues in the proteins found in the bladder and the kidneys. The discovery of the drug, cisplatin was serendipitous. Cisplatin and other related platinum-based anticancer drugs such as carboplatin and oxaliplatin belong to a class of drugs called metallating agents known to cause intrastrand crosslinking usually between adjacent guanine residues. The metal centre of these drugs is electron-deficient. Currently, all platinum-based antineoplastic agents in clinical use are Pt (II) complexes with square planar geometry. Cisplatin is administered intravenously for the treatment of testicular, ovarian and advanced bladder cancer. To conclude, alkylating agents, crosslinking agents and metallating agents all share one common characteristic which is electrophilicity and interact with DNA by the formation of covalent bonds. DNA topoisomerase enzymes are responsible for the regulation of DNA supercoiling. There are two known types of topoisomerase enzymes in humans, topoisomerase I and topoisomerase II. Transcription cannot take place if DNA cannot unwind. Should transcription cease, cell death ultimately results as protein synthesis comes to a halt. Plants are rich sources of biologically active compounds. Camptothecin is conjugated, polycyclic phytogenic compound extracted from the bark of the ‘happy tree’, camptotheca acuminata. This compound is known to target the complex formed between topoisomerase I and DNA. Podophyllotoxin is a phytogenic chemical extracted from the roots and rhizomes of Podophyllum plants. Etoposide and teniposide are polycyclic antineoplastic agents derived from podophyllotoxin. Etoposide is used for the treatment of cancers such as Kaposi’s sarcoma and lung cancer. Teniposide primarily used to treat childhood acute lymphocytic leukemia. Podophyllotoxin and its derivatives are known inhibitors of topoisomerase II. Intercalators insert between DNA base pairs perpendicular to the axis of the helix. Cationic groups found in intercalators may interact with the anionic sugar-phosphate backbone through ionic interactions. The aromatic, planar polycyclic systems may interact with DNA via noncovalent π-π interactions. Hydrogen bonding and van der Waals interactions also help the intercalators stay in place. Intercalation can be detected through various techniques including electrophoresis, nuclear magnetic resonance spectroscopy (NMR) and X-ray crystallography. Three families of intercalators will be discussed briefly and these are the anthracyclines, anthracenes, and phenoxazines. Anthracyclines are a class of intercalating drugs derived from Streptomyces bacteria. Both daunorubicin and doxorubicin belong to this class of drugs. Anthracyclines are used to treat a wide range of cancers. Anthracyclines are thought to exert their anticancer properties though intercalation, topoisomerase II inhibition, iron-mediated generation of free oxygen radicals, and the Induction of histone eviction from chromatin. As the name suggests, anthracenes are intercalators that bear an anthracene nucleus. Mitoxantrone is an example of a drug that belongs to the anthracene family of intercalators. Mitoxantrone is primarily administered intravenously and is often used to treat metastatic breast cancer, acute myeloid leukemia, and non-Hodgkin’s lymphoma. This drug is known to prefer binding to Guanine / Cytosine -rich DNA sequences. The phenoxazine family of intercalators are structurally similar to anthracenes. However, unlike the anthracenes, the central ring bears nitrogen and oxygen heteroatoms. Dactinomycin is an example of an intercalator belonging to the phenoxazine family. The medicinal chemistry of anticancer drugs is a broad topic. In this article, DNA-interactive antineoplastic agents are discussed. Future articles will feature other compounds used for the treatment of cancer, such as antimetabolites.